That's how many workers out of 600 employed in 2017 when a paper plant in Combined Locks, WI was closed who are now back on the job. What happened? The paper mill previously produced the glossy paper used for brochures and other business applications - a market in steep decline as such hard copy tools go increasingly digital . That plant was shuttered two years ago, as did many other paper plants in the Badger state. But the factory was acquired not long after that by Midwest Paper Group, and reopened not to make shiny white paper but brown paper used to make shipping cartons instead. Ecommerce - and China - have brought new life to the plant. Amazon and other etailers have driven up the annual demand for corrugate by the billions of square feet - an industry metric - in recent years. And ironically, China's recent refusal to take paper waste from outside the country for recycling due to a variety of concerns has pushed the price for recycled paper into the toilet. Since recycled paper is a key ingredient in making brown corrugate, the industry's US costs have also dropped sharply making old plants financially viable. The Combined Locks facility has 1.2 million square feet of total production space cross several buildings connected by tunnels, and operates 24 x 7. That's how many distribution centers worldwide are expected to be using robots of one kind or another in 2015 - up from 4000 currently. That according to a new report from the analysts at ABI Research. The report says the rise in robot adoption rates will be driven by the increasing affordability and thus return on investment from a growing variety of "infrastructure-light robots," as well as continuing needs for flexible and efficient automated fulfillment as same-day delivery becomes the norm. 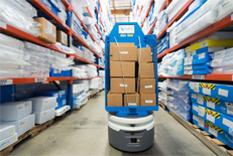 “Robots enable warehouses to scale operations up or down as required while offering major efficiency gains and mitigating inherent challenges associated with labor and staffing," says Nick Finill, a senior analyst at ABI. Both next-generation automated guided vehicles (AGVs) and autonomous mobile robots (AMRs) are driving the growth and are directly replacing heavier mechanized automation that typically requires massive upfront investment and rigid physical infrastructure, ABI added. That's how many new 15,000-TEU container ships carrier CGA CGM - the sector's fourth largest provider - just ordered from state-owned China State Shipbuilding Corporation (CSSC). This is significant, because South Korea and other nations have big leads over China in cargo ship building, in a deal valued at more than $1 billion for ships to be delivered in 2021. Environmental concerns were key to the order: five of the ships will be powered by liquefied natural gas, an increasingly popular choice as regulators push the industry to use cleaner-burning fuel. The other five will be equipped with expensive “scrubbers” that clean ship emissions from sulfur. CGA CGM and China also also signed an ambitious cooperation agreement to develop more efficient and environmentally-friendly vessels. The 15,000-TEU size is also interesting, as that is down from the 18,000-20,000 TEU ships ordered by many carriers in recent years, as those sized megaships may be proving too challenging to operate and to fill with containers. That's about how many minutes it takes a drone from UPS to deliver blood, organs for transplant and other critical medical supplies from source to destination around healthcare organization WakeMed's sprawling medical campus in Raleigh, North Carolina. By car, those deliveries of time-critical goods can sometimes take up to 30 minutes in traffic. On Tuesday, UPS launched what some are calling the first revenue-generating drone delivery in the US, as this was not a pilot run but the real deal, accomplished under the FAA's program to develop safe drone applications. We're actually not sure this marks the first commercial drone delivery application - several years ago, a bar in Wisconsin was making beer runs to ice fishermen and a Michigan florist was using drones for flower delivery before the FAA shut them both down - but its meaningful news nonetheless. However, as we reported last year, a US company called Zipline has a major operation - by far the largest in the world - using drones right now to deliver medical supplies to hospitals all over Rwanda. UPS is using a drone from Matternet for the job, though it says its set to make fewer than 10 drone deliveries a day for now.